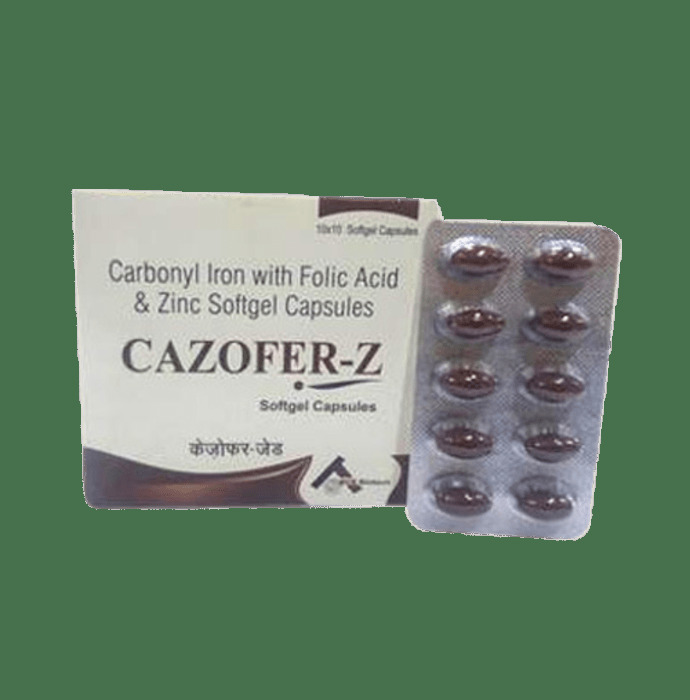 Cazofer Z capsule is a haematinic preparation enriched with Carbonyl Iron,Folic Acid and Zinc. Carbonyl iron is a form of iron which offers higher absorption and least chances of GI disturbances. Iron transports oxygen throughout the body and maintains red blood cells, thus making an individual feel energetic and preventing anemia. Folic acid is essential to numerous bodily functions ranging from nucleotide biosynthesis to the remethylation of homocysteine. It is especially important during periods of rapid cell division and growth. Both children and adults require folic acid to produce healthy red blood cells and prevent anemia. Zinc important during pregnancy. It is essential for normal foetal growth. Anaemia due to pregnancy, lactation and chronic haemorrhage, Menorrhagia & worm Infestation, convalescence and general debility. Cazofer Z capsule can be taken orally with water, after meals.